The handsome solid wood look of our Amish Holmes Office II Lateral File Cabinet will bring warmth into your office or home. This Amish handcrafted Lateral File Cabinet is available in a Mission style with reversed side panels or a Classic style with raised panel sides. 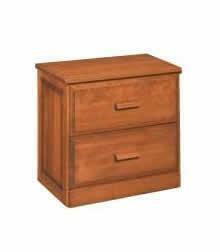 You also have the choice of two lateral file drawers or three lateral drawers. All file cabinets come with full extension drawer slides for ease of filing.